You'll explore the less-touristy side of things at Nagu Church and Lotta Museum. Escape the urban bustle at Bellevue Beach and Tuusulanjarvi (Lake Tuusula). 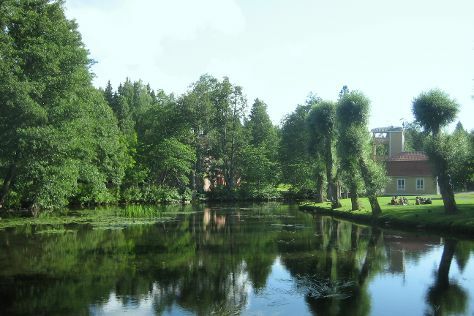 Explore the numerous day-trip ideas around Fiskars: Tuusula Church (in Tuusula), Sipoo (Savijarvi Gard Manor & Gumbostrand Konst & Form) and Hanko (Gunnarstrand, Tulliniemi Nature Path, & more). Spend the 10th (Mon) exploring nature at Teijo national park. Spend the 15th (Sat) exploring nature at Ekenas Archipelago National Park. To find where to stay, reviews, ratings, and other tourist information, read our Fiskars tour itinerary planner . If you are flying in from Turkey, the closest major airports are Helsinki Vantaa Airport, Turku Airport and Tampere-Pirkkala Airport. In November, daytime highs in Fiskars are 4°C, while nighttime lows are 0°C. Wrap up your sightseeing on the 29th (Sat) early enough to travel back home.